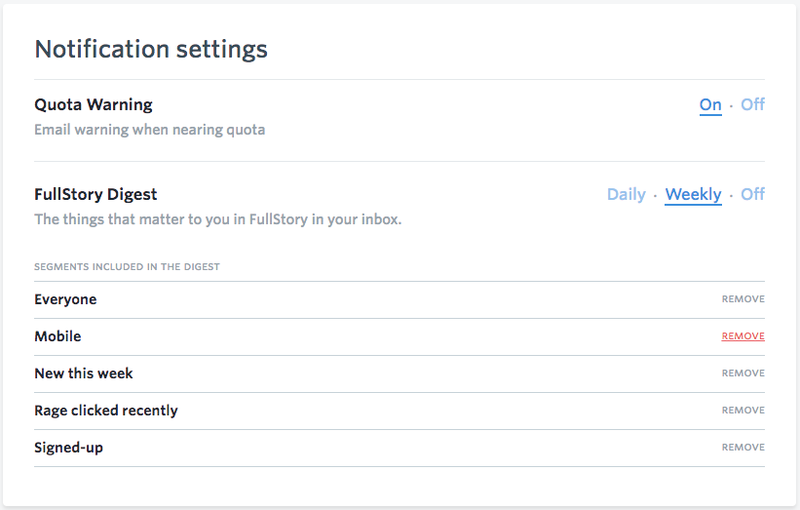 When you sign up for FullStory, you'll automatically start receiving a weekly digest email with summary statistics for your recorded data. You can customize this email by following specific segments or increasing frequency from weekly to daily. Summary statistics Snapshot and previous period comparison of the total visitor count, average event count per session and average active time per session for the current time period. The period will either be past week or past day, depending on your email frequency setting. Standout Segments Segment activity and previous period comparison for the five most active segments that you're following. 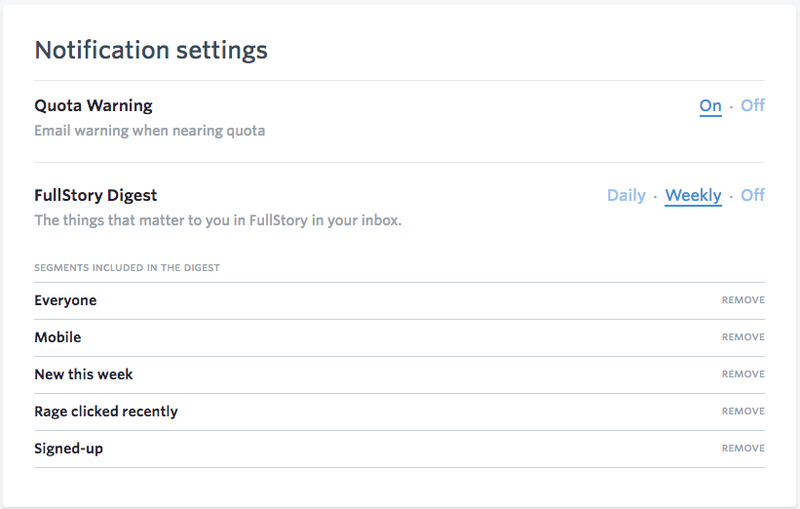 By default, you are following the 5 auto-segments in FullStory (Everyone, Signed-up, New this week, Rage clicked recently, and Mobile). Notable Notes Notes or comments that have been added to sessions by your teammates since the last digest email. New Segments Newly saved segments that have been created by your teammates since the last digest email. All Segments Segment activity and previous period comparison for all of the segments that you're following. Teammates A summary of any new teammates that have been added to your FullStory account. Navigate to Settings > Notifications to manage your Digest Email options. By default, the email is set to send weekly. Weekly emails are sent ~2:00 AM UTC Monday. Weekly emails compare statistics for the previous week. You may choose to receive the email Daily. Daily emails are sent ~2:00 AM UTC every day. Daily emails compare statistics for the previous day. You may also choose to turn the email OFF (never receive). You can change this setting at any time. Your digest email can serve as a form of daily email alert for key segments. You can add any segment to your digest email to keep track of its movements on a daily or weekly basis. By default, you are following the 5 auto-segments in FullStory: Everyone, Signed-up, New this week, Rage clicked recently, and Mobile. At the top right of the page, hover over on In digest.